Star Casts are : Nikhil Siddharth, Simran Pareenja, Samyuktha Hegde, Rakendu Mouli, Viva Raghav, Sameer Malla, Mourya Siddavaram, Karthik Adusumalli, Brahmaji, Hanumanthe Gowda, Raghu Karumanchi, Naveen Sanaka, Viva Suh, Shiju, Pramodini Pammi, Sayaji Shinde, Arohitha Gowda, Deepthi Sunaina, Amit Anand Raut, , and Others. 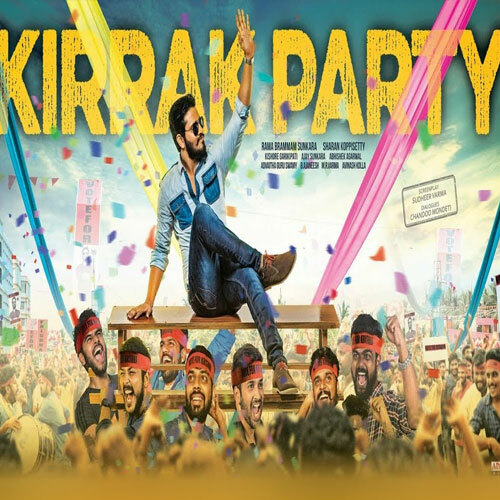 Write & Share about " Kirrak Party Movie Review, Tollywood Kirrak Party Live user Review Update, Tollywood Kirrak Party Movie Latest Updates | Telugu Cinema Profile" ! We do not sell pirated Kirrak Party DVDs & VCDs. We recommend you to buy movies of original DVD & VCD. We do not provide paid / free Kirrak Party Movie downloads. We do not offer to watch Kirrak Party movie online. Kirrak Party Movie Review/Comments are added by registered customers via Facebook Comments. Kirrak Party Movie Star Rating by unique customer filtered by IP's. Free wallpapers download of Kirrak Party movie, hero, heroine, etc is available in our Gallery section. Kirrak Party Wiki & Box office collections are updated regularly.